Hi modders, I created big pack with animations for you! What is idea this pack? Do you use others works? I started making pack on 13th June. This pack contain all animations from BG, BG2, BGEE, IWD, IWD2, PST. There are ~162 animations. To comparison - orginal game has ~280 entry in ANIMATE.IDS and there are many repeating animations (recolored). There are all soundset too, but I didn't tested it too much, and there aren't soundsets for PST yet. There are entries of ANIMATE.IDS EXTSPEED.2DA EXTANIM.2DA and my work-file.csv, weidu, one script and one program. 4.) Making new .cre which use animations and have everything good - weapon range, class, race, general, statistics. I would like to attach one creature per one animations. (and it shouldn't be "cat" or "wizeye"). If you make something, send it to me! How works animations slots in BGEE? I can only quote @Scottbrocks. CAN_LIE_DOWN = [0, 1] Do we have frames where we are on the ground? Death animation checks this. DOUBLE_BLIT = [0,1] Should probably always be set to 0, but the DEMB animation has this set to true. HEIGHT_CODE = string - "WQM", "WQL", "WQS", etc. The prefix to the weapon animations. Will be set to "NONE" for most monsters. RESREF = string - animation resref. MDOG, ARAB, etc. RESREF_ARMORBASE = single char, 'T' thief, 'W' wizard. This is the 4th character in CHM? Can you tell me, where the difference between your mod and Infinity Animations is? Except that IA isn't compatible to BGEE yet. 1. List with slots from Infinity Animations is useless for BGEE, because animations on these slots doesn't works! 4. Bams have others name, I used core name from orginal game. 7. Dynamic repaletted PST animations. How can I quick test it? Very nice update @viader!!! Looking over what you did there. I like that bam.avi showing how you setup the palettes, clever. Thanks, this form allow to re-use PST models, we can make from one model - many models each with diffrent palette, unfortunately I haven't artist eye to this, maybe someone can help? Many animations from PST wait on repaletted, for now I repaletted only 3 animations. 5. Are there sounds table - soundsets and sounds? 6. Are there all animations from PST? I reported all, but some aren't repaletted. Nice. You sure do know your stuff! How about Temple of Elemental Evil? There are a lot of usable stuff there I guess. It isn't technically IE, but they're cousins of some sort as it is still D&D. Great, full import is possible! I'am not a graphics 3D, so I can have problem with render it. Is here any graphics 3D? @Kaeloree Can we, what with copyright for ToEE? Maybe, additional content only for fans ToEE. @viader I think TOEE is out of the range of safe games, unfortunately. Thanks for clarification! @Illustair So, it is possible, but we can't do it. That's unfortunate, maybe on another site then. Or maybe bend the rules a little as Troika, the developer of the said game, is non-existent already. And why are other IE games allowed in the first place then; how do we exactly draw the line between games that may be allowed or not? I may understand of Lionheart: LotC though as I just checked right now, the developer company Reflexive Entertainment is very much alive and the game isn't exactly D&D but only a little bit in spirit. @viader these look fantastic! Since you're already in the business of converting IE game stuff to work with BGEE... would you consider taking all the CHARNAME voice sets from BG2, IWD1/2 and packaging them into a mod to work with BG:EE? There's a million threads and links to NPC soundsets, but I don't think anyone has compiled all the player soundsets from the different IE games and made them available for the EE. @agris Great idea! I can attach it and I think that, I do it. Great job with those animations, I missed them. Ps. I wonder if you can help with an old request I made long time ago: would you be able to convert the Power-Hungry voice set from NWN2? I feel as if summoned to this page... Would you like a power hungry voice? @Vaider this looks awesome by the way! Yes, I summon you, because I just thinking about animations for mummies But mummies went to my home and bludgeoned me to delete message. @Vaider ... No! No! No! They were not bludgeoning the delete key they were trying to punch the like button... It's hard to coordinate if you have bandages wrapped around your hands! @viader Do you still like the idea about other CHARNAME voice sets? Great work! Does this pack contain also BG vanilla NPC animations? @Pecca Yes, but only clean bams, because I didn't set number of slot for these animations. Any idea which slots are responsible and free for NPC animations in BGEE? @viader, this is good stuff, but i wanted to ask, for clarification, do the sprites from Original Baldur's Gate(BG1), work? When you upgrade it for BG2:EE i mean. @Mornmagor I wouldn't like to promise something too early. I know that you thinking about something, what was support by IE mod, but really I never install it, so could you desribe effect which I should provide? For the BG1 animations, Infinity Animations replaced the LOW animations with the ones from the older game. I am talking about the player character animations. Icewind Dale also had another sprite that someone could use as a player character, a big looking armored guy with a shield and a flail, but i can't remember the name now, so i'll have to experiment to find him when you make the mod. If your pack has all BG and IWD animations, both the BG1 character sprites and that particular sprite from IWD will be there, so i'll find them and then i need to see how to import it. @Mornmagor my pack have all animations, but there aren't any duplicated animation, eg: if BGEE had animation a 'fire elementar' I don't included it to pack from BG2, if I copy one animations from IWD I don't copy this same animations from IWD2. But, I don't know that characters sprites are diffrent, in this situation I add to pack characters animations from games (BG,IWD, IWD2? ), and option to select one. Character animations from BG and IWD are the same. Same with BG2 and IWD2. The character animations to be included are in BG1. 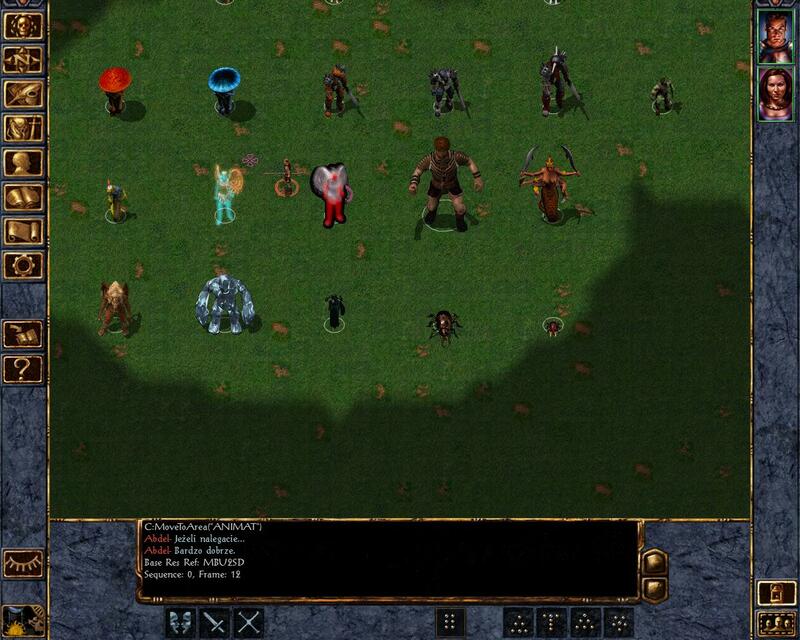 Since BG1 and IWD1 have the same character animations, and since IWD2 uses the BG2 ones, which we already have. So we only want BG1 character animations from these. The other sprite from IWD was an enemy actually that i was talking about. It's probably in the monster sprites and it is unique, so we can just find it and put it in when the mod is ready, since you have all animations in. It's one of them, and in there somewhere. Hey @viader, are you using the 1pp package at all? I know some animations, like the celestial / planetar, had incorrect alpha blending in vanilla BG2. 1pp v3 fixes this, iirc. @agris nope, I used only orginal animations, change alpha blending isn't difficult, I didn't know that some animations are broken, but heh, I see that there are more and more things to do I assume, that I should look on 1pp package. 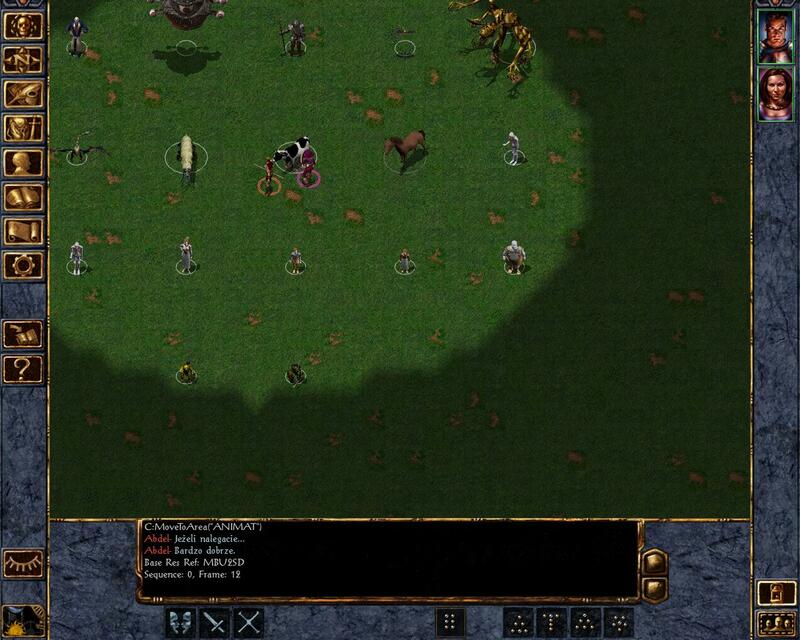 @Mornmagor I just conform pack to BG2EE and BGEE all at once. I don't add option to install old BG1 characters animations, because there was problem with two weapon animations, I must check it twice. If you want resume old animations, copy everything from directory 'animations_BG1_characters' to override.